For this week’s iDevBlogADay post, I’m going to try to explain all the things that have happened since last week’s The Story So Far post. I’ll probably miss some stuff, but this’ll at least give you a general idea of what happened. My experiment from last Tuesday worked exactly like I hoped it would. The moment the price dropped to 99c the sales shot through the roof. Within a day, Trainyard went from #48 to #9 in the US charts, and by the next day, it had reached #2, achieving my goal of overtaking Angry Birds. It was a crazy plan, but it worked. Trainyard stayed at #2 for around two days, and then dropped to #3 for a few more days. 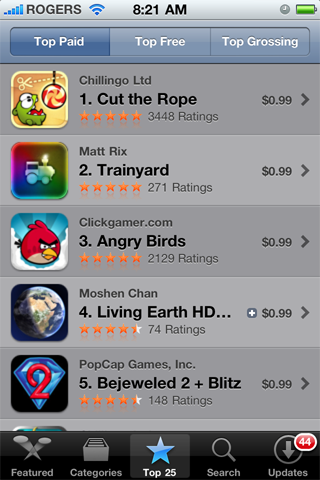 Yesterday it was passed by Cartoon Wars 2, so it’s currently sitting in #4. I wouldn’t be surprised if it drops even lower in the next couple days, but that’s just how things go. The past week has been absolutely surreal, and I’m pretty sure the life-changing-ness of it hasn’t really hit me yet. It’s been a blur and it’s been exhausting. I’m getting TONS of support emails, which isn’t really a problem, but it takes a lot of time. I think I’ve already been asked to port the game to Android over 30 times (for the record, I’ve only been asked to port it to Palm once). News of the game’s rise up the charts spread around to a variety of Apple and gaming blogs. It received a great review from TouchArcade and mentions from heavy hitters like Boing Boing, TUAW, Gizmodo and Joystiq. A lot of people seemed to be more interested in last week’s blog post about the story of the game than the game itself, which was fine with me. When I wrote that post, I had a feeling it would be a popular one, but it blew away all my expectations. Trainyard Express was also influenced by Trainyard’s success. When I wrote last week’s blog post, Express had just over 500,000 downloads. Right now, it has over 2 million. Knowing that over 2 million people have played a game I made is mind boggling. Obviously I’m hoping that the soft-upsell works, but even if it doesn’t, just having that large of a user base gives me an opportunity to reach way more people than I did before. When I come out with a new game or a new feature in Trainyard, I’ll be able to tell those users about it and hopefully get some good release-day sales. The massive number of users playing Trainyard Express also put a huge toll on the trainyard.ca server, but it’s held up quite well so far. There are now over 380,000 solutions available to view on the site, and that number is increasing at a rapid pace. At its peak, over 100k solutions were submitted in a single day. Just for comparison, in the first three months of Trainyard’s existence there were less than 4,000 solutions submitted. Everyone has been awesome, especially in the indie iPhone dev community. I’ve received many great comments and compliments about the game and the story behind it, and I’ve loved every single one. It’s really cool to be part of an industry where despite the fact that technically we’re competing against each other in the App Store, everyone works together and is genuinely happy for each other’s success. The local indie dev community here in Toronto has also been awesome. I’ve received a few offers to speak at events (something I’m honestly a little scared of, but I guess I’ve gotta learn sometime), and I’ve already met a bunch of other cool local people. I regret not participating in the community a bit more in the past, but I figure now is as good a time as any to start being more involved. I’ve now made enough money that I can live comfortably for the next year, but I’m not leaving my day job just yet. I’m planning to stick around at Indusblue till the end of the year. I really want to finish off my current projects, and I think it’ll give me time to plan exactly what I’m going to do next year. I know that I’ll be staring my own small games company. At first I’ll probably be the only employee, but depending on how well Trainyard keeps doing, I may be able to expand to actually hiring another person or two. Starting a company means I have to come up with a company name, which is one of those things I find really hard to do. Luckily, I’ve created a Company Name Generator to help me out with the process. At the time I released Trainyard Express I was already hard at work on a new game, one that was completely different from Trainyard, but now I’m having to rethink my plans. I’m going to refocus my attention back on Trainyard for the foreseeable future. I always had big plans for it, but it didn’t really make business sense to spend hundreds more hours updating a game that only 3000 people owned. Now that it’s popular, I’d like to really focus on it and implement some of the most requested features, like Game Center support and user created puzzles. I also have a couple unique things planned for the game that I don’t think anyone is expecting. A month ago if you told me all this was going to happen, I probably wouldn’t believe you, but here we are. It’s been an incredible experience, and I just want to say that I feel incredibly lucky and fortunate to be in the position I’m in right now. This entry was posted in App Store, iDevBlogADay, iOS Development, Trainyard. Bookmark the permalink. Congrats on the success Matt. Being one of the 3000 is kind of cool but no where near as cool as writing something that millions of people are enjoying! I hope this is just the beginning for you! Rock-n-roll!!! Sounds smart to ride the train you’ve launched, but don’t give up on that other game. Judging from the creativity embodied in Trainyard, your next idea is something I look forward to! Continued good fortune to you! It was definitely an awesome ride for us iDevBlogADay members. It’s awesome when one of our own make it big. I mentioned this already, but the fact that you had this success *while* having a day job is just awesome. You’re approach to finish the year and the project also speaks highly of your sense of dedication. I think you changing course from new game to supporting Trainyard a bit more is also a great idea. The one thing I’ve heard from those behind Pocket God and Doodle Jump is to continue to support your hit. The more support you give it, the more success it will yield. One thing that you didn’t mention that I wanted to ask was if any of the Big Publishers in the industry contacted you. You don’t have to tell, but I’m just wondering how the industry is handling the success of indies. Do they try to bring them into the fold or ignore them and hope they go away. I really haven’t heard anything from the big publishers, other than a little fun conversation with Rovio over Twitter DMs. I have been contacted by numerous “bizdev” type people from various other platforms about developing Trainyard for their devices, which is pretty common, as I understand it. Thanks again for the cool update! Epic tale, Matt. The game is awesome. I’m pretty stoked to witness what the next page will bring. Good luck and good fortune! You’ve definitely inspired me. Hopefully I’ll catch you at the Game Developers Conference coming up. You’re going, right? The story is amazing, and the game is super awesome!, haven’t finished it yet, but I will . Awesome story. As one of the ‘early adopters’, I’ve really loved the game and I’m happy that so many more people are enjoying it now. I wish you continued success. I’ve really enjoyed following this whole process! All this time working on iOS dev stuff, even my own game projects, and I forgot to consider all of us as competitors! It’s great! Great success for a great game ! Seriously, thank you Matt for that game. I enjoy every seconds I played the game. Congrats again Matt, much deserved! 2 million is a crazy amount of users, wish we had anything close to that . Good luck on getting that company setup! And yes, the android request emails are a daily ritual for me as well. Congratulations! Great to hear such a success story from a fellow Canadian indie developer. Are you coming to 360|iDev in Austin? You should. I’d love to, but I already booked off the last half of that week to go to Unite (the Unity conference) in Montreal, and I think it’d be a little too much travel to do both! Congrats from one indie dev to another That’s me #4 the only non-game on there. Which country are you showing? Hah, I wondered who the only other person with their real name was! That’s the Canada chart, but from last Thursday. Congrats on your continued success. As an aspiring iOS indie dev, it would be great to learn more about your development journey, from the code front. Any future blog post plans? You mentioned using Cocos2D as your library framework.. What did you use for physics/collisions? Box2D? I didn’t have any physics in this game, but in some recent prototypes for new games, I’ve been using Box2D a lot and loving it. Glad my $0.99 could help contribute to your success! Congrats! (from another envious and admiring indie dev) The game is fantastic, and the story is inspiring. Keep us in the loop with any conferences that you will be speaking at. Maybe I’ll pretend to be an iOS dev and show up to one. On a different note, I feel that we will be seeing another blockbuster in the future: “The iOS Frontier” (a la “The Social Network”). But who will take the leading role as Matt? It’s interesting how fast things can change. One day you could be thinking that this game’s potential has been reached, the next day you are thinking about starting your own company. Congrats on your success with this great game. Let me be the 2nd to ask for a webOS port. Indies do it wild style! Nice work Matt… really looking forward to seeing where you take this. That’s outstanding — Matt. Congratulations. You made an outstanding game with a ton of polish that’s a lot of fun. I appreciate you sharing your experience and thoughts along the way on the blog here, encouraging those of us indie gamedevs who are just about to jump into the shark-infested waters of the App Store that success is possible without a big team and budget. I love your game, it’s beautiful, although I found halifax compact too much of a leap. I would love to know why you chose cocos2d for the main game though… theres not physics or anything… perhaps for path finding…. or is that just for the partials and credit screen? You should be well chuffed thou. I don’t even use any of the menu stuff they have, although I do use the scene management and transitions. I mostly use it because of the display tree, it already has a ton of the basic work done that you’d have to do if you made your own game engine. It also has sound and classes for working with UIKit, texture management, and a whole bunch of other handy things. I heard about this through the cocos2d forums… fantastic to hear about your hard work paying off. Thanks for sharing your story! Good game, congratulations on your success. As a user who started with Trainyard Ex and then moved to Trainyard it would be nice to have a ‘import my progress’ feature. It was a bit jarring to go from the difficulty level near the end of Trainyard Ex to the easy difficulty of the beginning levels of Trainyard. Also from a user experience, I found the difficulty pacing of Trainyard Ex to be a bit better. A number of the earlier levels in Trainyard feel redundant. Still the game is a lot of fun, and I’m enjoying it so far and have recommended it to all my friends. Yeah I understand what you mean about the transition from express to the full game. I actually wrote a whole system to handle that, but then scrapped it because it was too complex for the user to do. I figure once you’re good at the game, you’ll solve the easy puzzles so quickly it doesn’t even matter. You’re right about the difficulty curve being better in express, I took the lessons I’d learned from Trainyard and applied them to express, especially with the difficulty curve. That being said, I think you’d be surprised at how many users still find the curve too steep in both games. It’s hard to appeal to everyone! I’ve finally decided to give Trainyard a try and what a remarkable piece of art it is! It’s fascinating to see huge success of a game that’s not focused on brainless birds shooting. I consider your game as a perfect execution of great, catchy idea, without going overblown on visual side. I’m really happy for your triumph, I’m looking forward to playing more games of yours. Jealous, but really happy for you. You give me hope to keep on trying. Sofa King Amazing! Great story about ambition and inspiration! Great job and many many congrats. Keep the ball rolling so you can break the shackles of working for someone forever! I’m super envious but your story is also very inspiring. I think my next game has a real shot at making it big so here’s to hoping! Good luck on all your future endeavors. Oh and thanks so much for sharing your story!!!!! This game looks so amazing, are you planning to port this to Android?! I would buy it so fast! Thanks for making it! Yep! It won’t be for a few months, but I’ve had a *ton* of Android requests, so it’s very much on my radar. Very inspiring to read your journey through the AppStore – this kind of behind the scenes account was exactly what I was looking for while I’m in preparation for releasing on the AppStore, thanks. Excellent quality (trainyard) and excellent blog posts – really first class. Thanks for the comment. I have no clue why you can’t see it in the South African app store. As far as I know, I selected every single country. Do you have any games available? I know in some countries, like Brazil, they’re not allowed to have any games in their app store. Check that “new territories” is also selected in the areas. modify it to better good or marketing advice. I wonder how to make peoples know my game, any ideas? thank u very much. I am chinease developer MengZhiXiang. Congrats Matt for your outstanding success! What a beautiful game it is. It would be enlightening a bit if you could touch upon why you chose cocos2D and some general game development tips as it would be helpful for begining developers like me. Thanks and good luck for your future endeavours! I chose Cocos2D because it’s a lot like Flash, which I was used to. It’s also ridiculously well supported and up-to-date, and the community is fantastic. So (2 million * o,99) – Apple cut (20%?). Shouldn’t that be enough to live comfortably for…years? I mean, you are a millionaire now. That’s pretty incredible, can’t wait to see what you do next. Just saw Trainyard Express in “Beckett Guide to Phone Apps” mag at Wal-mart in the US. It was listed as 5 stars and must-have. So if you see a spike in sales soon, that could be why. I’ve really enjoyed reading your blog, and I must say I am using what you have done here as a template of my latest game release. ( ZOMG BouncyBalls ) I’ve had several other apps that really didn’t do much. I’ve created an put out the game, for both Iphone and Ipad, Then waited until they were accepted and then launched a free version. I’ve also kept the platforms separate instead of a universal app. Why? I figured that the universal app would lose sales if a person had both devices. My first day downloads of the free app was about 300, but then my second day ( Jan 23rd) was close to 800. Hopefully this is a sign to come. But I do have a question, when did you start seeing your free version downloads start to spill over to the paid versions? Also, I’ve been looking at this FAAD model, where you put your app out for free for one day and they tell their users about it. I must say it is pricey. Pay them to list your app and give it away… And I think that what it will do is drive your ranking in the itunes store up….but at what price? So I think that also, ‘sequels’ are what also drive things up. Look at Angry and Cut, they have them. Adding levels to an established game may take money out of your pocket. BTW, I have other ideas that I would like to talk to you about but offline. Please email me if you can! I started to see the free downloads spill over a bit pretty quickly, but it was hard to tell whether it was upsell from Trainyard Express or just from buzz (ie. people heard others talking about “trainyard” and downloaded the paid one instead of the free one). I put way too many levels in the game, so it really wasn’t until a week or so that there started to be some upsell users. So if you’re normally making $50 a day, and with FAAD you make $150 a day, they take a percentage of $100, and only for a month or so. This right here is a Motivation Drug. Once i get my Ipod Touch i have to buy that app. Thanks for Sharing and liking my name “six apps”. Thanks for this honest and interesting post! We’re working to port an old game to iPhone and your data is helping us decide how to proceed and how much money and time to invest in the project.